The Me 163 rocket interceptor had been developed from a series of experimental gliders, equipped with what was at the time a highly experimental engine. As soon as the system matured to the point of basic functionality, it was pressed into service largely unchanged from its experimental basis. As a practical fighter, the resulting design had a number of serious shortcomings. One of the aircraft’s biggest problems was a side effect of its greatest strength; its high speed. In practice, pilots found it very difficult to get enough rounds into an enemy aircraft before they were already past it. This led to numerous developments for more powerful weapons, but this problem was never wholly cured. Another issue was that, like most gliders, the Me 163 landed on a skid under the aircraft, as opposed to conventional landing gear with wheels. This meant when the aircraft came to a stop on the field after landing, it could not be moved until a Scheuch-Schlepper three-wheeled transporter jacked it up onto a dolly. This left them open to air attack while they waited in the fields. But by far the biggest problem was the limited fuel load and resulting low endurance. The aircraft had a total power endurance of less than 8 minutes, much of which was used up taking off and climbing to altitude. This gave the aircraft very little time to find and attack the enemy, limiting it to a small area of operations almost directly above its own base. When initially proposed for operational use, there had been talk of building dozens of such bases to provide continual coverage, but as the problems above became clear these plans ended. Although the Me 163 had very short endurance, it had originally been even shorter. In the original engine designs the rocket had only one throttle setting, “full on”, and burned through its fuel in a few minutes. Not only did this further limit endurance, in flight testing, pilots found the aircraft quickly exhibited compressibility effects as soon as they levelled off from the climb and speeds picked up. This led the RLM to demand the addition of a throttle, leading to lengthy delays and a dramatic decrease in fuel economy when throttled. This problem was addressed in the slightly updated Me 163C. This featured a new dual chamber rocket engine; the upper chamber was tuned for high thrust while the lower was much lower thrust for cruise. In operation, throttling was accomplished by starting or stopping the main engine, which was about four times as powerful as the smaller one. This change greatly simplified the engine, while also retaining much higher efficiency during cruise. Along with slightly increased fuel tank-age, the powered endurance improved to about 12 minutes, a 50% improvement. As the aircraft spent only a short time climbing, this meant the time at combat altitude well over doubled. Throughout development the RLM proved unhappy with the progress on the 163 project, and eventually decided to transfer development to Heinrich Hertel at Junkers. However, Lippisch remained at Messerschmitt and retained the support of Waldemar Voigt, continuing development of the 163C. 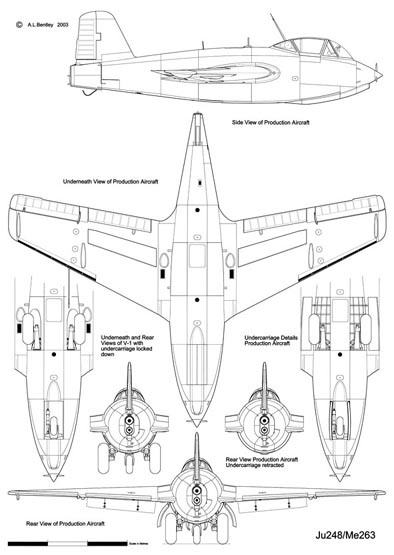 At Junkers, the basic plan of the 163C was followed to produce an even larger design, the Ju 248. It retained the new pressurized cockpit and bubble canopy of the 163C, but had even more fuel tankage and a new retractable landing gear design. On 25 September 1944 a wooden mock-up was shown to officials. The production version was intended to be powered by the more powerful BMW 708 rocket engine in place of the Walter power plant. Prior to the actual building of the Ju 248, two Me 163Bs, the V 13 and the V 18, were slated to be rebuilt. Unfortunately, the V 13 had deteriorated due to weather exposure, so only the V 18 was rebuilt. It is this aircraft that is often identified as the Me 163D. However, it should be made clear that there was no Me 163D, as this aircraft was built after the Ju 248 project had started. Hertel had hoped to install Lorin ramjet engines, but this technology was still far ahead of its time. As a stopgap measure, they decided to build the aircraft with a Sondergerät (special equipment) in the form of a Zusatztreibstoffbehälter (auxiliary fuel tank). This meant two 160 L (42.2 US gal) external T-Stoff oxidizer tanks were to be installed under the wings. This would lead to a 10% speed decrease but no negative flight characteristics. Although Junkers claimed the Ju 248 used a standard Me 163B wing, they decided to modify the wing to hold more C-Stoff fuel. This modification was carried out by the Puklitsch firm. In November 1944, the aircraft was again re-designated as the Me 263 to show its connection with the Me 163. The two projects also got names – the Ju 248 Flunder (Flounder) and the Me 263 Scholle (Plaice). 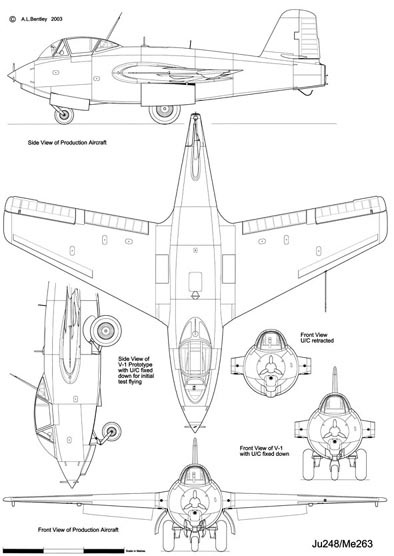 In early 1945, Junkers proposed its own project, the EF 127 Walli rocket fighter, as a competitor to the Me 163C and Me 263. This was typical for the German war industry where companies still tried to outbid each other instead of focusing resources on a common project. First un-powered flight of the Me 263 V1 was in February 1945. Several more un-powered flights took place that month. The biggest problem had to do with the centre of gravity which was restored with the addition of counterweights. Eventually, the production aircraft would have repositioned the engine or the landing gear installation to solve this problem. The landing gear was still non-retractable. The results of those first flights was the aircraft gave a “ziemlich fertigen Eindruck”, meaning that it seemed to be ready. Test flights were later stopped because of fuel shortages for the Bf 110 towplanes. As the Me 263 was not a part of the Jägernotprogramm (Emergency Fighter Program), it was difficult to get the resources it needed. For the time being the plane was not expected to enter production but further development was allowed. The V2 and V3 were not yet ready. The V2 was to get the retractable landing gear and the V3 would have the armament built in. The next month both the V1 and the V2 had the two-chambered HWK 109-509C installed, correcting the centre-of-gravity problems. They flew only as gliders. In April, the Americans occupied the plant and captured the three prototypes and the mock-up. The V2 was destroyed but another prototype ended up in the USA. The rest was handed over to the Russians who then created their own Mikoyan-Gurevich I-270 interceptor.